Original Fiorucci Italian wristwatch in new condition with original box, tag and certificate of ownership. This top designer watch was made in Italy and the design has been retired making it very collectible. 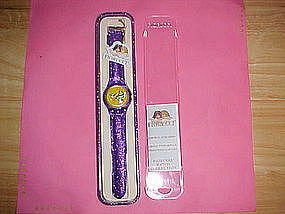 Beautiful mint in box Fiorucci designer wristwatch featuring two angels on watch face. Watch and watch band are gold in color. It comes with original tag and owner certificate. This models design has been retired making it very collectible. This wristwatch was made in Italy. 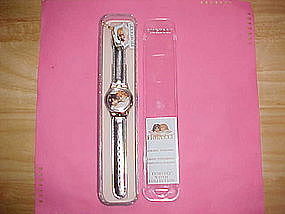 Beautiful Fiorucci designer wristwatch mint in box. It features two angels on the watch face. The watch and band are silver in color. This watch comes with original tag and owners certificate. 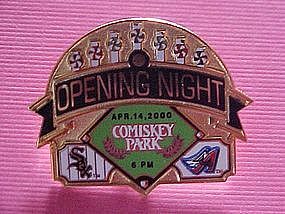 This design has been retired making it very collectible. This wristwatch was made in Italy. Fabulous handbag by famous Vegan designers MATT & NAT of Montreal. This handbag is brand new complete with original label and packaging. It is of the popular design model " MIAMI " and is the desirable color "LIME." 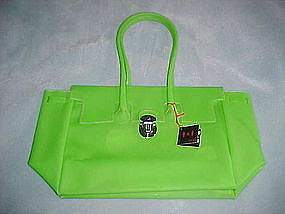 The handbag itself is 15" long and 7" in height, including the handle is 14" in height. This cool handbag features one inside pocket with a detachable key ring. Make the scene with this great eye cathing bag!! Fabulous ladies handbag by famous vegan designers " MATT & NAT " of MONTREAL. 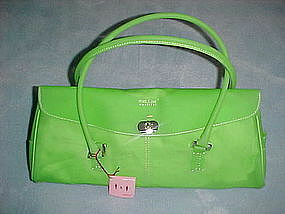 This handbag is colored lime green and in the popular model CAOUTCHOUC. This bag is brand new with original label and packaging. 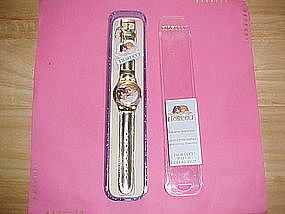 It measures almost 19" long and 10" high, with handle almost 19" high. This is a great handbag or a super Beach Tote!!! It features one inside compartment with detachable key ring. If you want to be seen when you make the scene, this is the bag for you!! Fabulous handbag by famous Vegan designers " MATT & NAT " of Montreal. This handbag is brand new and complete with original label and packaging. 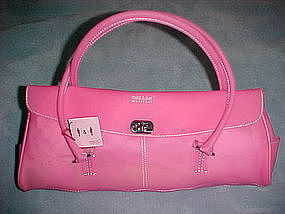 It is of the popular design model " MIAMI " and is the desirable color " Fuchsia ". The handbag itself is 15" long and 7" in height, including the handle it is 14" in height. This cool handbag features one inside pocket with a detachable key ring. Make the scene with this eye caching bag!!! Fabulous ladies handbag by famous Vegan designers " MATT & NAT " of Montreal. 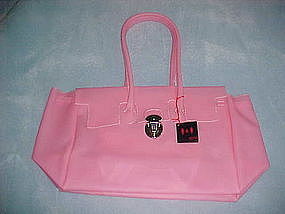 This handbag is Pink in color and in the popular model CAOUTCHOUC." This bag is brand new with original label and packaging. It measures almost 19" long and 10" high, including handle it is almost 19" high. This is a great handbag or a Super Beach Tote!!! It features one inside compartment with detachable key ring. If you want to be seeb when you make the scene, this is the bag for you!!! 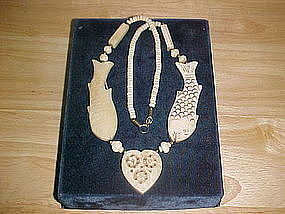 Hand carved ethnic bone necklace. 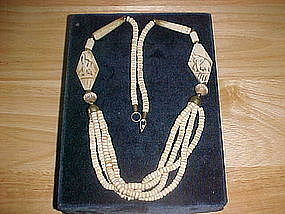 This interesting tribal handicraft features hundreds of hand carved bone beads. This necklace includes two 1 1/4" beads, each that feature a carved trunk raised elephant for "GOOD LUCK". 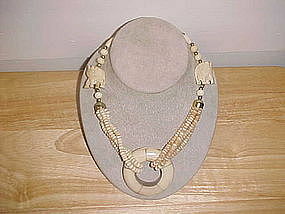 This necklace is in fine condition and measures 25" long. Wonderful Industrial 3 piece jewelry set. This set is signed ' STAINLESS STEEL, SHEFFIELD ENGLAND '. 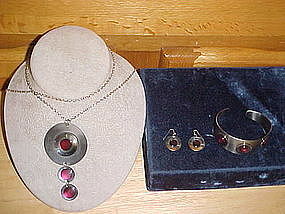 This set is made from stainless steel with applied light maroon glass disc. The pendant, excluding its chain measures 3 1/4" long with its largest disc being 13/16" in diameter, the bracelet is 1" thick and is at present 2 3/8" wide but can be adjusted to a larger or smaller size and earrings, each are 3/4" in diameter. This set is in excellent condition and a work of Modern Art!!! $ 175.00 - "SOLD" - THANK YOU !! 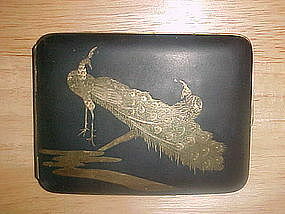 Beautiful 1920's Komai cigarette case. The front side features a pair of peacocks, both male and female. 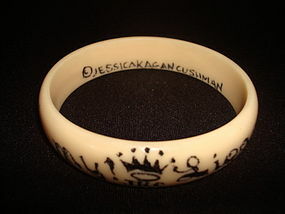 The back side features an image of Mount Fuji with birds flying and the signature "K" inside a diamond. This Damascene cigarette case is made of iron with inlayed gold. This case measures 2 1/8" long and 3 1/8" wide and it is in fine condition. 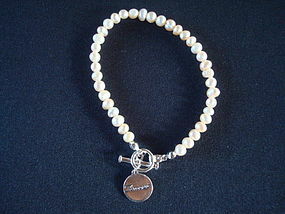 $ 35.00 "SOLD" - THANK YOU!!! 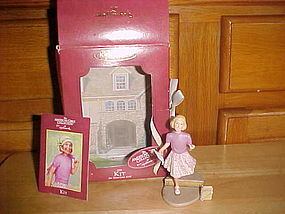 Rarest of the series THE AMERICAN GIRL COLLECTION from HALLMARK, KIT. 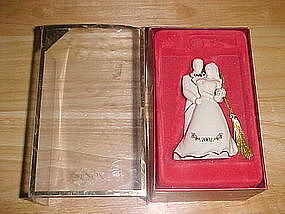 This Hallmark ornament is in Mint condition and comes with its original box thas is in very good condition. 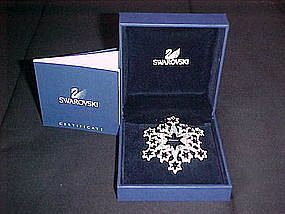 A great gift for Hallmark Ornament collectors!! !